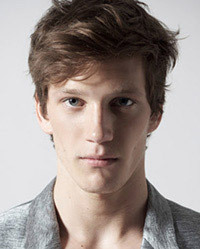 Florian Van Bael was born in Brussels, Belgium, is an Belgian male model. He was discovered in People Shoe Design store in his home town Brussels, by model scout Samuray from modeling agency IMM. Florian's hobbies are listening to music, practicing sport and hanging out with friends. His favorite artist are David Copperfield and Houdini. De Morgen Magazine Covers, Kult Germany, Esquire Russia, GQ Japan, Dutch GQ, L'Officiel Art Thailand, 160 Grams, Lui France, Manifesto, GQ Style China, METAL Magazine, Homme Style Cover, Apollo, Fantastic Man, Antidote, Hercules, GQ Italia and Australia, L'Officiel Netherlands, Elle Netherlands, Prestage Magazine, Essential Homme, ODDA Magazine. J Lindeberg, Sarar, Daks, Massimo Dutti, Bensimon Jeans, Etro, Mavi Jeans, Bjorn Borg, Bensimon, Aldo Shoes, Pull & Bear, Giorgio Armani, PAGUCI, River Island, Benetton, Peuterey, Globus Switzerland, Banana Republic, Uniqlo. Walked runway for Moncler, Etro, Viktor & Rolf, John Richmond, Giorgio Armani, Vivienne Westwood, Daks, Trussardi, Dolce & Gabbana, Frankie Morello, Fendi, Hogan, Philipp Plein, Ermanno Scervino, Emporio Armani, Salvatore Ferragamo, Corneliani, Carlo Pignatelli. Represented by agencies Major Model Management New York, Ford Models Europe Paris, Models 1 London, Why Not Model Management Milan, Sight Management Studio Barcelona. Mother agency IMM Bruxelles. I find a good and healthy lifestyle very important. I would say that I’m obsessed about a lot of things, especially the things which I’m really interested in. I love to hang out and chill with a good friend of mine at his place and watch some good soaps or movies on his computer. Music makes me feel good and it’s also a great company when I have to be a bit alone and think about a few things.